Much on the expected lines and after five weeks of a significant pullback, the Markets chose to take a breather in the week that went by. The benchmark NIFTY50 stalled its up move, moved in a range and ended the week with a net loss of 74.05 points or 0.69%. The level of 10790 was mentioned in our previous weekly note as a potential resistance levels and the previous week’s high stood at 10784 with the NIFTY resisting precisely in the mentioned zone. As we approach the coming week, we expect the Markets to continue to consolidation. The relatively low levels VIX in recent times has made some room for volatility returning and persisting in the Markets in the immediate near term. Just like it happened in the previous week, we expect the level of 10790 acting as immediate resistance levels for the Markets along with 10890. Supports are expected to come in at 10550 and 10430 zones. The Relative Strength Index – RSI on the Weekly Charts is 57.6791. RSI remains neutral to the price showing no divergence. The Weekly MACD still remains bearish as it trades below its signal line. However it is seen steeply moving towards positive crossover. If the coming week does not see any major declines, we may see this indicator turning bullish as well. No significant formations were observed on Candles. 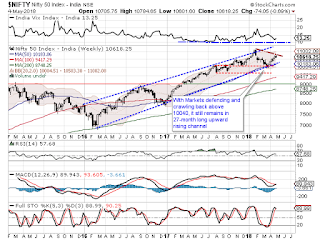 Pattern analysis of the Weekly Charts shows the 27-month long upward rising channel intact. However, a potential lower-top in the form of the 10784-mark is seen being formed. 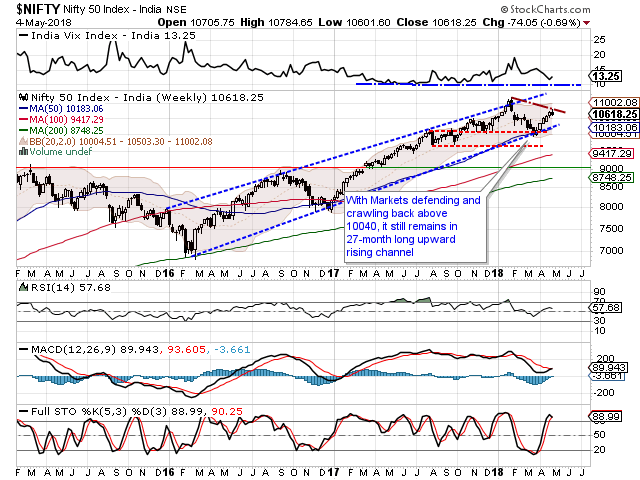 In other words, this area is a important resistance in the immediate near term for the Markets. Overall, the structure of the Charts and the indicators point towards two distinct possibilities. First, it is very much likely that the NIFTY will continue to witness some more consolidation and we will also see some volatility creeping in as well along with this. Secondly, it is equally likely that despite near-certainty of the consolidation or mild corrective moves spilling over to the coming week, we will see resilience from the Markets and downsides, if any, will remain limited. However, fresh up move shall occur only after the levels of 10785 are breached on the upside. Effective rotation of sectors and selective approach towards stocks will remain indispensible in the coming week. 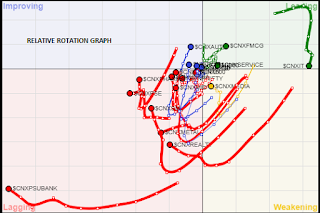 A study of Relative Rotation Graphs – show that IT Pack is evidently seen losing momentum and might enter a longer consolidation phase. We will see relative outperformance from the FMCG pack along with services sector components. We will also see betterment of relative performance from the AUTO, Financial Services, NIFTY MID50, NIFTY NEXT50 and broader Indices like CNX100 and CNX200 as they are all seen entering the Improving Quadrant while bettering their relative momentum. We will also see sectors like PHARMA, PSUBANKS, BANKNIFTY, SMALL CAPS, INFRA and MEDIA consolidating and contributing through stock specific out performances. All this is cumulatively likely to keep Markets resilient to downsides. Apart from this, no noticeable show is expected from Metals, REALTY, ENERGY, Public Sector Enterprises apart from attempts to consolidate.